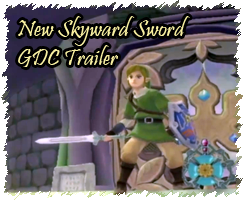 This article includes copious amounts of speculation regarding Skyward Sword. You have been forewarned. Stories of ancient struggles among the people are among the most common myths in the entire Hyrule legendarium. We hear several times of a period, not long after the beginning times, when wars break out among the people. This always marks the beginning of an age of greed and strife, of bloodshed and betrayal, and of wicked magic and monsters. But because each of these stories contains different and often conflicting details, theorists have run into difficulties as far as reconciling them. In the wake of Skyward Sword‘s GDC 2011 trailer, which gave us a closer glimpse at Hyrule’s ancient era, I’ll take another stab at the issue. 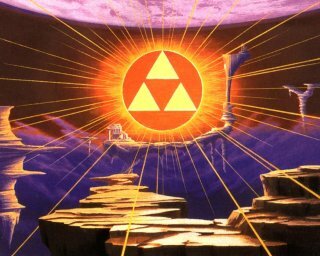 Many aggressively searched for the wish-granting Triforce, but no one, not even the Hylian sages, was sure of its location; the knowledge had been lost over time. Some said the Triforce lay under the desert, others said it was in the cemetery in the shadow of Death Mountain, but no one ever found it. That yearning for the Triforce soon turned to lust for power, which in turn led to the spilling of blood. Soon the only motive left among those searching for the Triforce was pure greed. The other point is that even though there was much bloodshed and exchange of information, the hidden entrance to the Sacred Realm was never found. Since the story continues from here to the moment when Ganondorf’s band of evil thieves finds and opens the entrance, it’s clear that Ganondorf is supposed to be the first person to have successfully infiltrated the realm. This fact will be especially important later on. Some time ago, before the King of Hyrule unified this country, there was a fierce war in our world. One day, to escape from the fires of the war, a Hylian mother and her baby boy entered this forbidden forest. The mother was gravely injured… Her only choice was to entrust the child to the Deku Tree, the guardian spirit of the forest. The Deku Tree could sense that this was a child of destiny, whose fate would affect the entire world, so he took him into the forest. After the mother passed away, the baby was raised as a Kokiri. Now the war has become intertwined with Link’s own story, as his adoption by the Kokiri results from his being orphaned by the violence. But the fierce war tale establishes yet another potentially important detail: the country has not yet been united by the King of Hyrule. Given that Hyrule seems to be made up of smaller tribe-nations such as the Gorons, Zoras, and Gerudo, it could very well be that the land was divided into factions who were at war prior to Ocarina of Time. 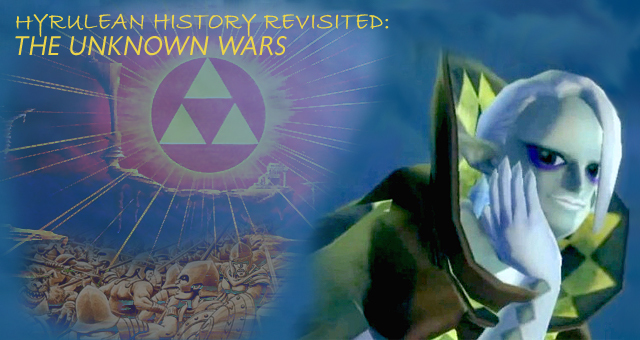 While whether this war actually has the Triforce and the Sacred Realm as its object is certainly up for debate, it still parallels the bloodshed of A Link to the Past pretty nicely, despite its vague details. As some may have noticed, in Ocarina of Time the location of the Sacred Realm is quite certainly known by the Royal Family of Hyrule. Many have suggested that because of this the fierce wars cannot possibly be the conflicts described in A Link to the Past‘s manual, since it states that the location of the Sacred Realm was completely forgotten, even by the Hylian sages! Nonsense, I say! If you’ve read my A Legend and a Timeline article from last year, I treat the idea that perhaps we’re not supposed to treat the Zelda games like a literal history where every game fits neatly in place without contradiction. Since even the confirmed connections, famously including Ocarina of Time to A Link to the Past and The Minish Cap to Four Swords, have their share of mismatched details and omissions, it seems that we’re supposed to take these stories as actual stories that fit together in a common mythological tradition. You know, I don’t think it would be fair to say this is the complete true sequel to Ocarina of Time because anytime you say you want to make a game like that, that it’s a true sequel, you then really have to implement in that game a number of elements that would have existed in the prequel to really tie those two games together in a complete and true way. Anytime you do that it makes it more difficult for those people who hadn’t played through the first game to really access and enjoy as much. That being said, this game on a number of different levels is going to have some ties to Ocarina of Time, so people that didn’t play that game when they do play this game will be able to realize and understand what’s going on. That’s straight from the maker, folks – Zelda games are not designed to be cohesive in a “complete and true way” in order that the stories are more accessible to newcomers. This echoes true with what Miyamoto once said about each Zelda game being a “new story” bearing connections to the others that bind them together, but that they also don’t let the timeline restrict future story developments. With the idea of a “complete and true” timeline brought into question, we’re more free to draw connections without being fully tied down by the details. That said, it’s time to move into yet another controversial layer of the discussion of the ancient wars in Hyrule’s history: the stories of the dark tribe. 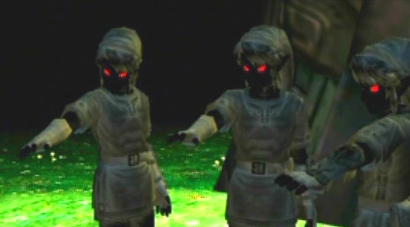 The first mention of an evil tribe was actually in A Link to the Past, when Agahnim mentioned the “Tribe of Evil” that would use the Triforce to spread darkness over Hyrule with the dissolution of the Sages’ Seal. As it turns out, this ‘tribe’ is actually a specific term for the magical demons that often serve a Demon King, such as Ganon. They’re not necessarily some kind of ‘race’ on the same level as the Hylians, Sheikah, or Gorons. Long ago, a dark tribe invaded Hyrule. They were defeated and imprisoned within the Dark Mirror, which reflects the darkness in people’s hearts. The tribe’s mirror prison was then secreted away and hidden in the forest temple to sever its connection to this world. For ages, the people lived at ease, content in mind and body. But then, word of the Sacred Realm spread throughout Hyrule, and a great battle ensued. Among those living in the light, interlopers who excelled at magic appeared. Wielding powerful sorcery, they tried to establish dominion over the Sacred Realm. It was then that the goddesses ordered the three Light Spirits to intervene. They sealed away the great magic those individuals had mastered, and the tribe was banished, chased across the sacred lands of Hyrule and driven into another realm, a world of shadows. The goddesses left behind but a single link between the worlds of light and shadow: the Mirror of Twilight, which passed to the protectors of Hyrule. Sound familiar? The story opens with a very similar scenario to that found in A Link to the Past: the people learn about the Sacred Realm and start fighting one another in order to obtain it. The cutscene accompanying Lanayru’s story portrays the conflict as especially dramatic, involving not only bloodshed but treachery, corruption, and lust for power. Because of the similarities to both the in-fighting of A Link to the Past‘s backstory and the story of the dark tribe and mirror from Four Swords Adventures, it’s not hard to see this as a fusion of the two tales. Given that the time period for this story is sometime before Ocarina of Time it also logically follows that this retelling is supposed to be connected in some way to the civil war described in that game, corroborating our earlier suspicions. Later on in the game, we hear a reference to the “prolonged wars” that nearly killed off the Sheikah clan that served the royal family, another clear homage to Ocarina of Time‘s history. This is a tale from long ago. It’s the tale of the first settlers of this land. In the beginning, the people followed the spirits of good, and all was peaceful. But that era of peace soon came to an end. The evil Demon King rose to power, destroying everything in his path. The spirits of good had no choice but to face him in battle. The war that ensued seemed to last an eternity, and much blood was shed. Finally, the spirits subdued the Demon King, though they could not destroy him. Their powers were greatly depleted. With their remaining power, they buried the Demon King’s spirit in the ground. They built shackles to imprison him and a tower that acted as a lock. These shackles cover the land to this day. With their power drained, the spirits of good returned to the heavens. Suddenly bereft of both demons and spirits, this land was entrusted to us. This story is a bit more complicated in terms of fitting it with the other ones. After all, there certainly wasn’t any evidence of “shackles” crisscrossing over the land in the other games, and Spirit Tracks is supposedly set in a completely new land discovered by Link and Tetra anyway. The missing references to the Sacred Realm and other features of the previous stories is also a bit suspect. Taking it in the context of “legends,” however, we might see it as an adaptation of that same story that leads into a totally new Hyrule legend. After all, The Wind Waker and Phantom Hourglass are largely devoid of stories from this particular era of Hyrule’s mythological history. The stories don’t have to match up perfectly in the factual sense because mythology can have all kinds of alternate versions of the same tale, such as the multiple accounts of the births of the pantheon of Greek deities or of real-world creation myths. All in all, while the parallels are interesting there’s not enough to go by to give this a positive connection to the stories it’s adapted from. While the idea of the dark tribe’s story being embellished to feature a full-fledged Demon King seems like a neat new addition to the story, we’ll have to wait for future stories to show us whether there’s any merit behind it. The new Skyward Sword gameplay trailer is only a few days young, and already there have been a wealth of theories and ideas emerging about its potential story connections based on the new details we’ve seen. There are a lot of new cultural elements, design features, and locales to think about, but I want to focus specifically on one of the most infamous revelations: the mysterious new character. So far this is the first character we’ve seen in Skyward Sword apart from Link, but he leaves a powerful first impression. Some have noted that, rather like how the Skyward Sword spirit bore some resemblance to the Master Sword’s hilt, the new character looks kind of like the Gilded Sword. This could suggest that the two belong to a similar race of sword spirits, which is an interesting proposition indeed. There’s another impression many have gotten, however, that I’d like to emphasize. At the end of the trailer, the figure vanishes from sight, leaving diamond-shaped particles in his wake. Many have rightly compared this visual effect to what happens when Twilight creatures dissipate – they too leave behind small particles, although these particles are blackened, presumably an aftereffect of a long stay in the Twilight Realm. Could this similarity be a bona fide connection? Could this strange man be an ancestor of the Twili? Now, Link resides in Skyloft and he is, again, just your average kid. He doesn’t think anything unusual about living on these floating islands, but unbeknownst to Link, below the Skyloft, below this cloud cover is another land. It’s a very dangerous place, it’s ruled by evil forces, and one day, an event occurs that forces Link to actually travel to that land. This sounds rather familiar to the literal Japanese translation of Lanayru’s cutscene, which stated that the dark tribe “tried to rule the Sacred Realm.” Now, we typically know the Sacred Realm as another world, separate from Hyrule, and I’ve even speculated that perhaps Skyloft is an incarnation of that Sacred Realm, but in the Japanese script of Twilight Princess there’s a heavy implication that the realm being referred to is Hyrule itself, which is a sort of holy land. This is likely a story simplification to keep things accessible to new players, since of course the Sacred Realm itself is not particularly important to Twilight Princess unlike in A Link to the Past or Ocarina of Time. In that sense, it may be that older fans are supposed to think about the otherworldly Sacred Realm while newer players won’t make that association. Nonetheless, the fact that the story reads this way is potentially important. 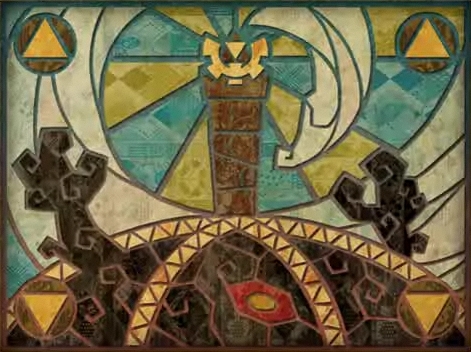 Could the surface world in Skyward Sword being “ruled by evil forces” wind up being a reference to the period when the dark tribe tried to rule the holy land? “But the dark tribe never succeeded in their goal!” some might say. “They were quickly overcome by the Light Spirits and banished for their use of forbidden magic!” Remember, though, that if we consider the stories as mere legends, where not every detail is dependent on those laid down in prior tales, this is no problem. A Link to the Past had no problem inserting a long mythological history for the Triforce even though originally it was just a magical relic the royal family used to rule the realm, and Ocarina of Time certainly didn’t mind putting a period of seven years during which Ganondorf actually took over Hyrule into its take on the Imprisoning War story. Such adaptations are common in the Zelda series, after all. 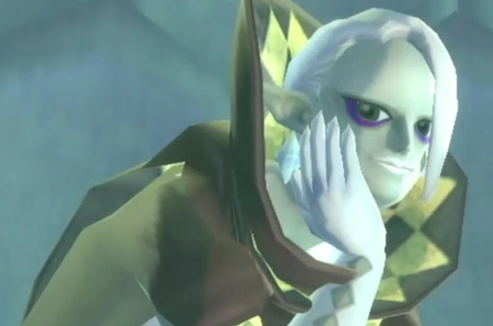 As a prequel, Skyward Sword is definitely perfectly poised to tell this story in a more direct way. All the “old stories” in the series’ history have taken previous elements like the Master Sword or the Sages and fleshed them out in some way, and it looks very much like Skyward Sword is going to continue this tradition. I can’t say I’m banking on these ideas as heavily as I might have in the past – although this is probably due more to me having wised up and started caring about gameplay first, and story second than to actual skepticism – but these are definitely the first impressions I’m getting based only on what we’ve seen and heard. Things may turn out quite different in the end – in fact, I hope they do.